Ralph Plaisted (30 September 1927 – 8 September 2008) and his three companions, Walt Pederson, Gerry Pitzl and Jean-Luc Bombardier, are regarded by most polar authorities to be the first to succeed in a surface traverse across the ice to the North Pole on 19 April 1968, making the first confirmed surface conquest of the Pole. 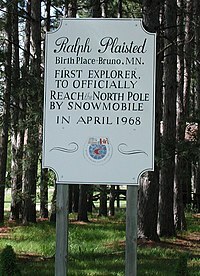 A sign in Bruno, Minnesota marking Plaisted's birthplace. Plaisted was a high-school dropout from Bruno, Minnesota, who found success as an insurance salesman. An avid outdoorsman, in the early 1960s he was one of the first Minnesotans to buy a Ski-Doo snowmobile, a then-novel invention of Canada's Bombardier Company, and became a convert and booster of the machine. In 1965, Plaisted drove his snowmobile 250 miles from Ely to White Bear Lake, Minnesota in one day, which is regarded as the first long-distance snowmobile trek. Plaisted and his friend Art Aufderheide conceived the idea of reaching the North Pole by snowmobile in the spring of 1966, aiming to make the trip the following year. Customized clothing was assembled for the team, which they tested by sleeping on a frozen lake in northern Minnesota. In April and May 1967 Plaisted's first attempt was thwarted at 83° 20' latitude by storms and open water. The attempt did result in a CBS-TV documentary To the Top of the World, reported by Charles Kuralt, who accompanied the Plaisted team. Plaisted returned for a successful attempt the following year in March, 1968. Starting at Canada's Ward Hunt Island just a few miles from Peary's start at Cape Columbia on Ellesmere Island, Plaisted began the 412 miles traverse on March 9. Navigating with a sextant and resupplied when possible with fuel and supplies dropped by a turboprop DeHavilland Twin Otter, the expedition members spent 43 days, 11 hours traveling on the ice before reaching their final camp on the evening of April 19. Navigator Jerry Pitzl made hourly sextant sightings over the next two days to confirm their location. On the morning of April 20, the party journeyed somewhat less than four miles to account for ice drift, and signaled a United States Air Force C-135 weather reconnaissance aircraft using a handheld radio. At 10:30 am eastern daylight time, the aircraft, call sign LARK-47, flew overhead confirming the party was exactly at the North Pole. The party was then flown out. Given the doubts surrounding the North Pole conquest claims of Robert Peary and Frederick Cook, Ralph Plaisted's journey is regarded as the first undisputed surface conquest of the North Pole. Affidavits signed by resupply pilots Welland Phipps and Ken Lee confirm that the expedition did not cover any distance by air. Lawson, Guy (2016-03-17). "An Insurance Salesman and a Doctor Walk Into a Bar, and End Up at the North Pole". The New York Times. ISSN 0362-4331. Retrieved 2016-12-14. ^ Weber, Bruce (2008-09-12). 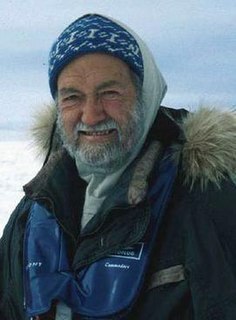 "Ralph Plaisted, 80, Adventurer and Polar Pioneer, Dies". The New York Times. ISSN 0362-4331. Retrieved 2019-01-29. ^ "Transport and Snow". Musée J-Armand Bombardier. Retrieved 2007-04-29. ^ Keith Pickering (2011). First To The Pole. North Star Press. Snocross is a racing sport involving racing specialized high performance snowmobiles on natural or artificially-made tracks consisting of tight turns, banked corners, steep jumps and obstacles. Riders race at speed of up to 60 miles per hour. Jumps are up to 30 feet tall, so riders travel up to 130 feet before they touch the ground. According to the World Snowmobile Association which governs snocross, watercross, and hillcross racing, snocross is the most popular form of snowmobile racing. The Crocker Land Expedition took place in 1913. Its purpose was to investigate the existence of Crocker Land, a huge island supposedly sighted by the explorer Robert Peary from the top of Cape Colgate in 1906. It is now believed that Peary fraudulently invented the island.